During my visit to New York City last month, I was excited that I had a several evenings to search for new food options after the workday was over. 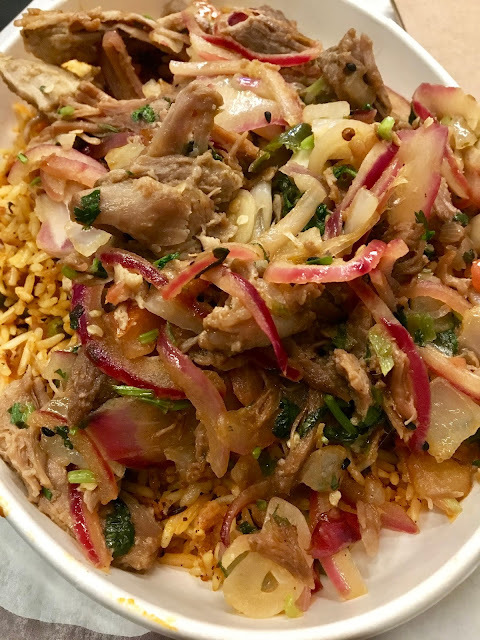 One such discovery was Indikitch, a New York City-based chain that spices up the fast casual assembly line model with Indian flavors and flair. I am a huge fan of Indian food and have been adding more and more Indian flavors and styles of food to my home cooking, but it's still such a treat to be able to enjoy Indian food when eating out. The cuisine is naturally inclined to be gluten-free friendly, and Indikitch's menu has a lot for gluten-free foodies to love. Everything on Indikitch's menu is gluten-free, save for the naan bread, kati rolls, & samosas. From the start, you get to pick what form you want your meal to take: rice bowl, salad, dosa, or a feast (a protein with four accompanying sides). Because I visited at an off-peak time, I was able to chat about gluten and dairy-free options without fear I was holding up the line, and requested that the staff change their gloves before preparing my meal, which they happily obliged. I decided to go for a rice bowl, and selected their slow-roasted pulled pork for my protein. The bowl came topped with pickled onions and fenugreek leaves. When it arrived at my table I marveled at the sheer abundance of the portion. Although I had quite an appetite, I didn't even get close to polishing it off. The pork was spicy and tender, the pickled onions tangy, and the bed of rice was aromatic and had a saffron flavor (though it was a bit dry). While my meal good, it wasn't spectacular and it was far heavier than I was expecting so I left regretting my choice of a rice bowl. I should have opted for a meal with more veggies, the abundance of meat and carbs in the bowl did sit right on my travel-weary stomach. Maybe a salad, dosa, or the feast would have had a wow-factor that would help Indikitch really stand out and above other similar style fast casual restaurants I have tried. I wouldn't discount paying Indikitch another visit, but it's in an uphill climb competing with other restaurants I have fallen in love with in New York City.